SPELT SPAGHETTI is, without a doubt, a declaration of love to your palate and senses. 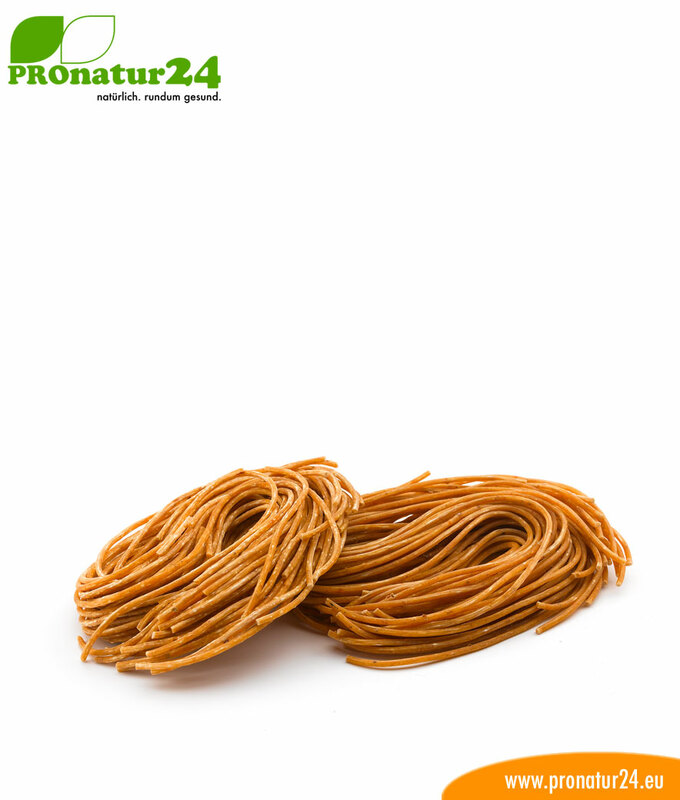 This spaghetti contains 100% spelt, 3 eggs from happy hens per kilo, colloidal gold and revitalized water. 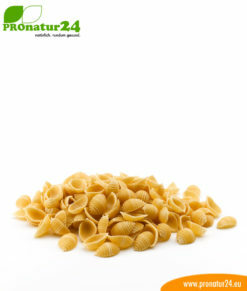 Spaghetti is undoubtedly among the most well-known Italian pastas. If you love Italian cuisine, then spaghetti is definitely one of the main foods in your kitchen. However, we go one step further in pleasure, quality and tolerability! 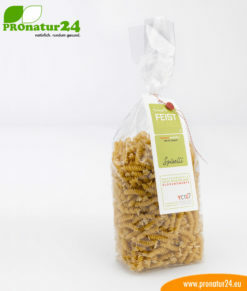 With this spelt spaghetti by FEIST spelt pasta, you will take the next step for your palate and for healthy nutrition in particular. 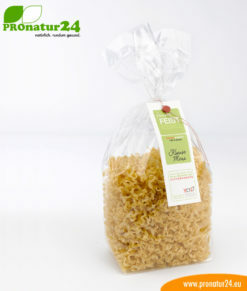 This spaghetti contains 100% spelt, 3 eggs from happy hens per kilo, colloidal gold and revitalized water. This spaghetti is, without a doubt, a personal declaration of love to your palate and senses. 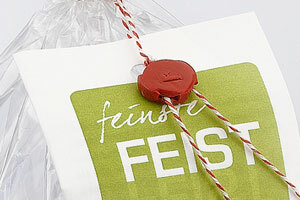 Test it and take the first step towards a totally new world of pasta, made by Susanne Feist. 5 directions of pleasure abduct your taste and senses! Put the pasta in boiling water, switch the hob off, and let the covered pasta simmer in the pot for 5-8 minutes. Afterwards, take it out of the water and put a bit of salt on it. Now start to spoil the palate! WARNING: Risk of addiction to spelt pasta and alpine cheese for your palate! Or, simply reawaken the child in you! 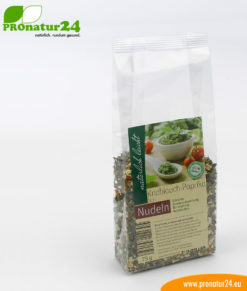 Herbal mixtures for a delicious pesto and/or the best cheese for an explosion of tastes in your mouth. 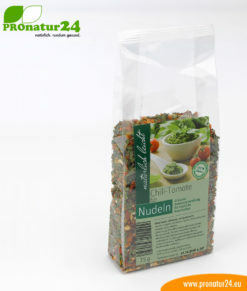 We recommend chili + tomato, tomato + basil, and garlic + paprika for a herbal mixture to make a delicious pesto. In terms of cheese… parmesan (parmigiana) is just one kind. Expand your choices of cheese for this special spelt spaghetti. Premium alpine cheese by Alpen Sepp conjures the highest regional quality of cheese from the Bregenz Forest in your pasta dish. Nearly 400 dairy farmers provide me with their hay milk for the most enjoyable cheese. Each lead sealing is informed with the “YCTinside technology”. This concerns vibrations and information – comparable to revitalizing water. If we don’t tell you anything, you simply see the lead sealing as a red quality seal. And if we do, please use the sealing to revitalize food and drinks in your storage space. Simply but the sealing on and try it out. SPELT, PEOPLE’S FIRST CHOICE OF GRAIN! Spelt is an ancient wheat and therefore contains similar ingredients to wheats. Spelt is an undemanding and resistant type of wheat. Spelt does not tolerate any intensive fertilizing. The spelt grain is better protected from harmful environmental influences thanks to an additional protective cover. Spelt can be used like all other types of grain.